Close your eyes and let the romanticism overwhelm you. Gaze over the Aegean Sea and enjoy the uniquely enchanted view of the volcano, the spectacular sunset, and the wild natural beauty of Santorini. Live your dream here, in Thirea Suites. We are located in Santorini, the island that is the dream destination for millions of tourists across the globe. Respecting the fact that you will be eager to have the best view on our beautiful island, we decided to build Thirea Suites on the most privileged private part in Oia, just above the almighty Caldera. All our suites have a breath-taking view! Enjoy from day one our genuine hospitality, the special pampering, and luxury all very evident at every luxury suite or studio of ours. Choose the one that suits you best, and let the magic around you to lead you into a once-in-a-lifetime accommodation experience. All of our suites and studios can accommodate up to two guests, and combined with our excellent location, will surely offer you a great sense of tranquility and exclusive privacy. We have created a distinguished environment that fully respects the architectural style and the mystic feelings found only in Santorini. Let us begin your tour into the luxurious premises of Thirea Suites. 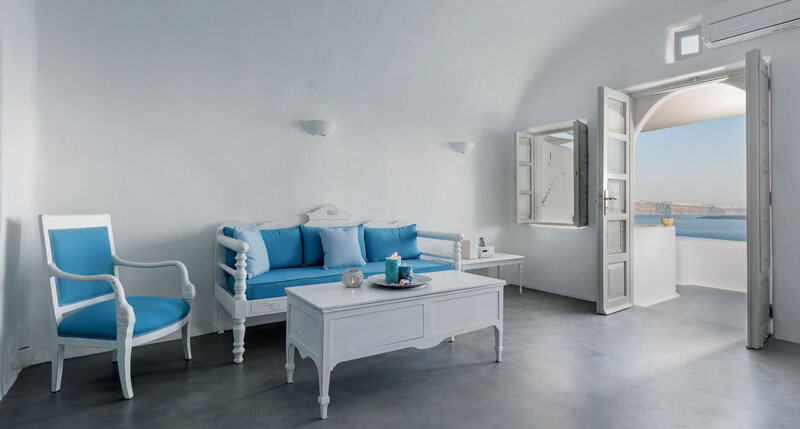 In the end, we are confident that you will choose one of our suites or studios for your next Santorini holidays! Thirea Suites create a unique amalgam of intense images, unique emotions, and exceptional moments. All of our suites provide a private terrace with outstanding view over the Caldera and offer a superior feeling of comfort, luxury, and exclusive privacy. Thirea Studios offer a distinctively amazing view, tranquility, elegance & stylish decoration in a romantic atmosphere. 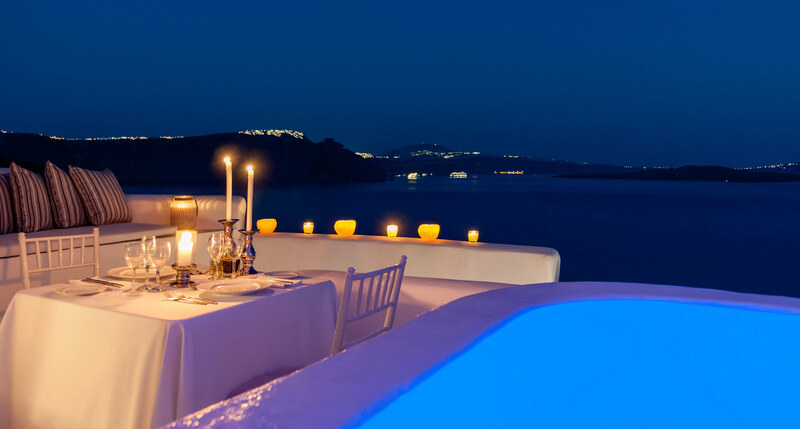 We will do our best for you to live a unique accommodation experience during your stay in magnificent Santorini. Our philosophy and primary objective is the ultimate satisfaction of our guests. This is why we have created Thirea Suites, offering unique benefits, superior service, and genuine hospitality as well as giving emphasis to every minute detail. My husband and I spent the last part of our honeymoon here and we loved every minute of it! 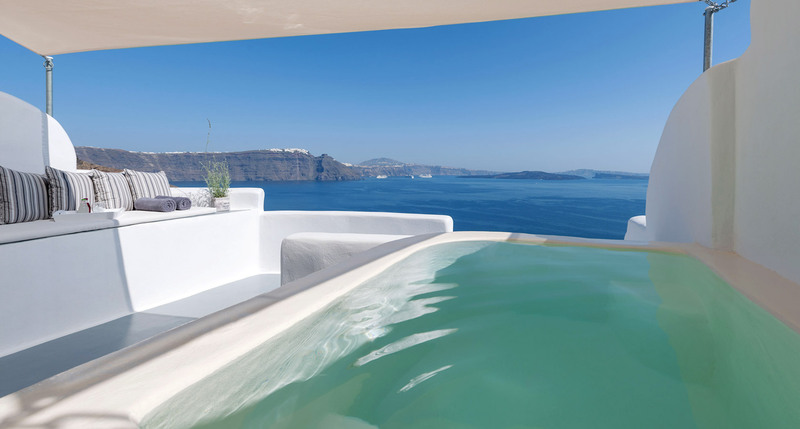 This hotel located in Oia offered superb views of the Aegean Sea. The service was exceptional with the owner coming to greet us when we arrived and delicious Greek breakfast each morning. We definitely want to stay here again! Thirea suites is highly recommended, our accommodation was the main reason we had excellent time in oia. The suites owner Eleftheria is such an amazing host, with such an amazing taste. Rooms are spacious, clean, brand new. Breakfast is served in the room and is freshly prepared! Suites' got a private balcony with an amazing view. Amazing! Perfection!!!! Best place ever! Can't beat the location. Very romantic. Market around the corner. Staff is wonderful. Very private yet close to all great restaurants etc. Exactly what we wanted. Incredible location for sunset. Thirea suites have three rooms and I booked the one with the hot tub and it was absolutely amazing! I got to Oia around 8am and Elefheria was very kind to arrange check in at that time... Highly recommend staying at Thirea Suites. The staff are extremely warm and friendly. Every moment during the stay was magical. Thirea Suites are located on the most privileged private part in Oia, just above the splendid Caldera, offering exclusive privacy & incomparable views of the Aegean sea.